In fact Ukrainian cuisine is so great that is famous all over the world. Its dishes are healthy and nutrient, there is a big variety of them and everyone can find what to cook for everyday and for holidays. Actually, among all the most delicious dishes from Ukraine, dumplings Varenyky (Pierogy) and soup Borshch (Borshcht) are the most popular. Even NASA released pictures of the Saturn’s moon Pan that has the shape of a delicious world wide famous Ukrainian Varenyk or Vushka. Ukrainian Borshch has a lot of variants a lot of different ingredients are added to Borshch but the most common are broth, red beets, cabbage, carrot, mushrooms, beans, onion, garlic. In is important that only fresh, high-quality seasonal ingredients are used. Also, as Etnocook has written recently, Ukrainians didn’t add tomatoes or acids in their soups. In Borshch was added homemade Beet Kvass that is very healthy and tasty beverage. In Japan healthy, nutrient and light dishes are widely spread and Ukrainian vegetable soup Borshch with sour cream becomes more and more popular. Why do Japanese people so highly prize Borshch? 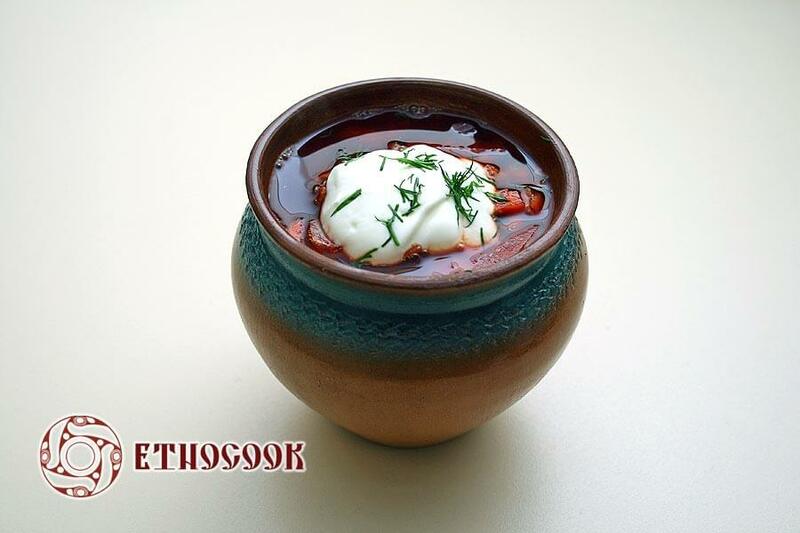 Etnocook reminds, that cooking of Ukrainian soup Borshch, like in Japanese cuisine, is based on “rules of five,” traditional Japanese cooking (和食, washoku). This style combines variety and balance of colours, cooking techniques and flavors. Indeed, the ancient recipes tell that in Ukrainian Borshch are used five colors: red (beets), white (dried mushrooms), yellow (carrot), and green (cabbage), black (black pepper). Five cooking techniques such as raw food, grilling, steaming, boiling, and frying are needed. And finally five flavors are represented in this magic soup: sweet, spicy, salty, sour, and bitter. Besides, Ukrainian Borshch is beautifully presented in a mug pot with sour cream and chopped greenary on the top that looks like a piece of art. — kamitomo (@kamitomo_2017) 7 січня 2018 р. — ユメネコ企画 (@CatsArt_mayucio) 11 січня 2018 р.